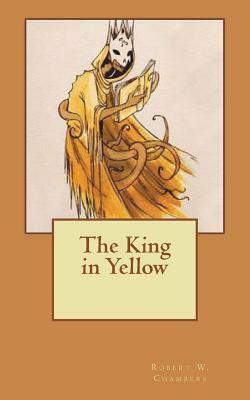 The King in Yellow by Robert W. Chambers The first four stories are loosely connected by three main devices: A fictional play in book form entitled The King in Yellow A mysterious and malevolent supernatural entity known as The King in Yellow An eerie symbol called The Yellow Sign These stories are macabre in tone, centering, in keeping with the other tales, on characters that are often artists or decadents. The first and fourth stories, "The Repairer of Reputations" and "The Yellow Sign," are set in an imagined future 1920s America, whereas the second and third stories, "The Mask" and "In the Court of the Dragon," are set in Paris. These stories are haunted by the theme: "Have you found the Yellow Sign?" The weird and macabre character gradually fades away during the remaining stories, and the last three are written in the romantic fiction style common to Chambers' later work. They are all linked to the preceding stories by their Parisian setting and artistic protagonists. We are delighted to publish this classic book as part of our extensive Classic Library collection. Many of the books in our collection have been out of print for decades, and therefore have not been accessible to the general public. The aim of our publishing program is to facilitate rapid access to this vast reservoir of literature, and our view is that this is a significant literary work, which deserves to be brought back into print after many decades. The contents of the vast majority of titles in the Classic Library have been scanned from the original works. To ensure a high quality product, each title has been meticulously hand curated by our staff. Our philosophy has been guided by a desire to provide the reader with a book that is as close as possible to ownership of the original work. We hope that you will enjoy this wonderful classic work, and that for you it becomes an enriching experience.